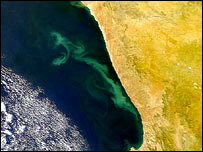 Concentrations of the natural pigment chlorophyll in coastal waters have been shown to rise prior to earthquakes. These chlorophyll increases are due to blooms of plankton, which use the pigment to convert solar energy to chemical energy via photosynthesis. A joint US-Indian team of researchers analysed satellite data on ocean coastal areas lying near the epicentres of four recent quakes. Details of the research appear in the journal Advances in Space Research. They say that monitoring peaks in chlorophyll could provide early information on an impending earthquake. The authors say the chlorophyll blooms are linked to a release of thermal energy prior to an earthquake. This causes the sea surface temperature to rise and increases the surface latent heat flux - the amount of energy moving from the surface to the air due to evaporation. And in turn, there is enhanced upwelling - the process by which cold, nutrient-rich water is transported from the deep sea to the surface. Upwelling boosts phytoplankton productivity and gives rise to blooms, which can be seen as increased concentrations of chlorophyll, specifically, the type called chlorophyll-a. The grinding of plate tectonics essentially couples the temperature of the land with that of the ocean, creating the conditions for plankton to thrive. "I do not think scientists expected such anomalous behaviour of [chlorophyll-a]," co-author Dr Ramesh Singh of the Indian Institute of Technology in Kanpur, India, said. "If the epicentre of a quake lies very close to the coast then anomalous [chlorophyll-a] concentrations are clearly visible along that coast." 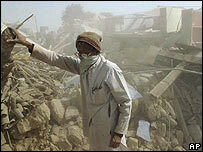 The researchers used as case studies four recent earthquakes in Gujarat, India (2001), Algeria (2002), the Andaman Islands (2002) and Bam, Iran (2003). Using satellite images and measurements of sea temperatures, they found a correlation between peaks in chlorophyll and proximity to an impending earthquake. The amount of "advance notice" depended on the ocean depth and proximity to the epicentre of the quake, with the second factor taking precedence. In the event of heavy cloud cover preventing satellites from monitoring chlorophyll production, sea temperatures could serve as a parallel means of information on impending earthquakes, argue the researchers.